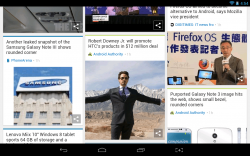 Now that Google Reader is gone, the search a news reader  is on. 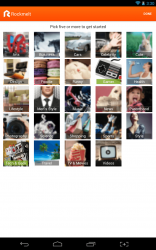 On the mobile front, you have the better known offerings like Feedly , Pulse , Flipboard  and even Pocket . Of course, it’s always good to have plenty of alternatives and that’s why I’m covering this next app. Rockmelt is relatively well known for their Chrome based web browser which offered a whole slew of social features. The browser has now been discontinued, but Rockmelt has a new piece of software on the market. 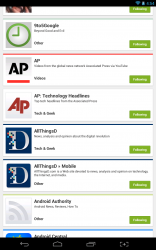 Rockmelt on Android is a mobile feed reader  that actually uses social media and other tools to create a relative content package. Previously available for iOS only, Rockmelt has made its way over to Android. For the conversion it’s undergone a total makeover, and it includes an improved UI, and a bunch of new features. Of course, since it’s only now available for Android, the whole thing is new for Android users. It’s designed to help you find content that’s more relevant to you, along with giving you opportunities to discover new content also. Rockmelt is a little strange at first when compared to normal readers. You log-in using one of many different social accounts and instead of submitting your own content to follow or subscribing to RSS feeds on your own you choose from pre-configured categories. When choosing what categories to display you must choose five or more, no less. That particular requirement I dislike, especially considering I have no interest in following five different categories worth of news. For others, that may not be an issue. You don’t have to login to use the app, you can actually poke around and check it out in a special “guest” mode. Unfortunately, when browsing as a guest you won’t be able to use any of the social features or advanced options. 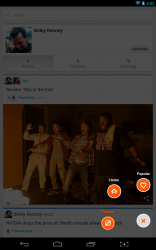 After logging in, you’re served with the content you chose during setup via your feed. Before we get to browsing, we’ll talk about the content itself. 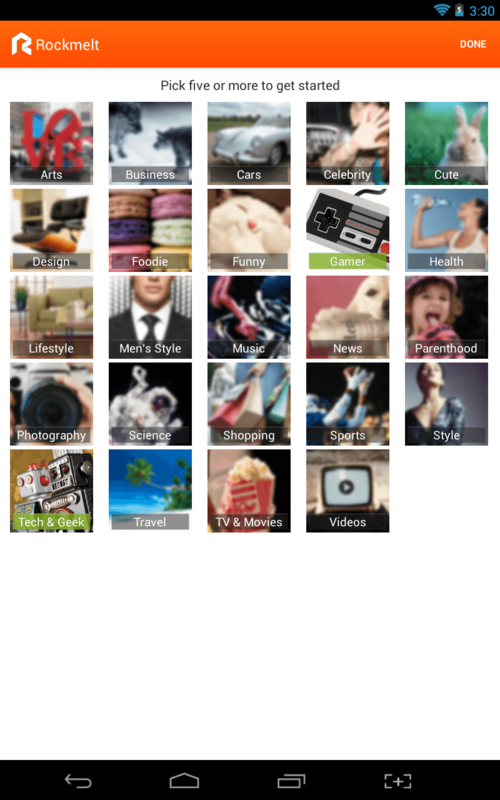 When choosing categories, Rockmelt actually subscribes you to particular website feeds based on your preferences. You can see the subscriptions individually in a list by going to your user profile. 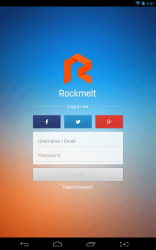 To access the menu, swipe up or down on the screen and a menu icon will appear in the bottom left, while a Rockmelt logo will appear in the bottom right. Tapping the Rockmelt log will allow you to navigate to the explore and popular feeds, and you can also navigate back to your home feed through this button. The menu button will pop-open a side menu holo-style. Choosing your profile will bring you to your social profile link. On the resulting page you can see activity, followers and subscriptions. You can also edit your profile, or link up Facebook, Twitter and Google Plus accounts. 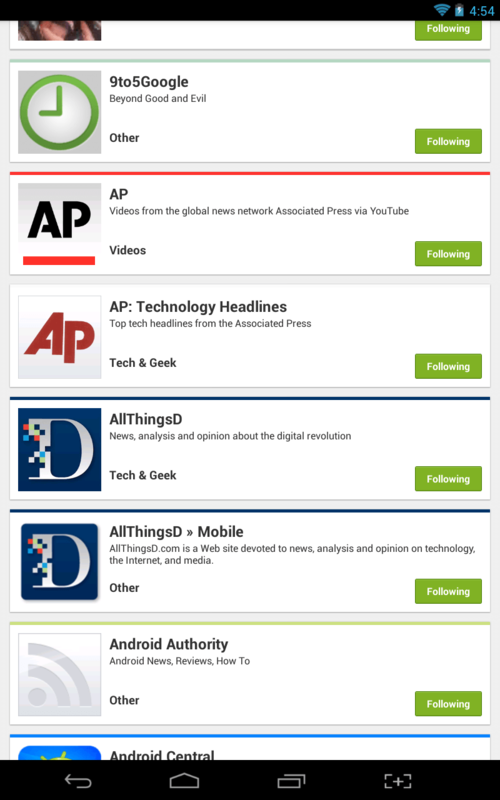 Active subscriptions are prominently displayed via your profile, and you can discontinue receiving feed content from the various sites by press the green “following” button, which will turn white to indicate that you have unfollowed the related site. Back at the main settings window you can import Google Reader subscriptions. Thanks to a direct Google Reader Import option. In order to import content you’ll have to login to your Google account and authorize access. Once you’re all logged in, you can pick and choose which previous subscriptions you’d like to import into Rockmelt, or you can just import them all at once. Now let’s get to the biggest feature, the content. 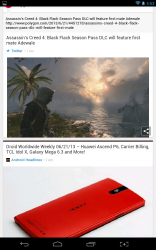 When tapping on an article, video or image the content will be displayed on your device in a minimal form. Realistically, it looks like most other mobile readers in that aspect. Where Rockmelt differs, is how you interact with the content. By tapping on the share button in the bottom right you can do several things. 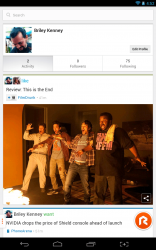 You can share the content via your connected social network accounts. You can post about the content via Rockmelt, and it works just like posting to Facebook or Twitter. Or, you can tag the content with several emotions like aww, want, hmm, lol or wtf. When you tag content with various emotions it will be logged and visible in your activity list via your profile. It works just like a social network post in that other users can come along and comment on your activity, or they can share it themselves. 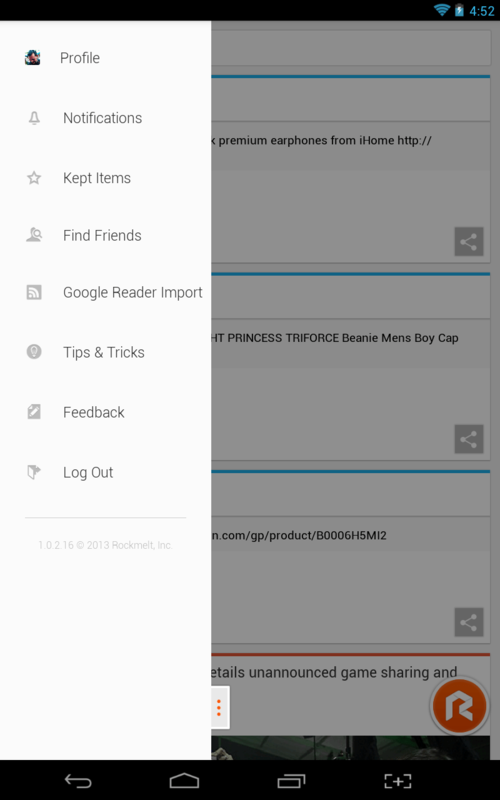 You can also save items by long pressing on a link. 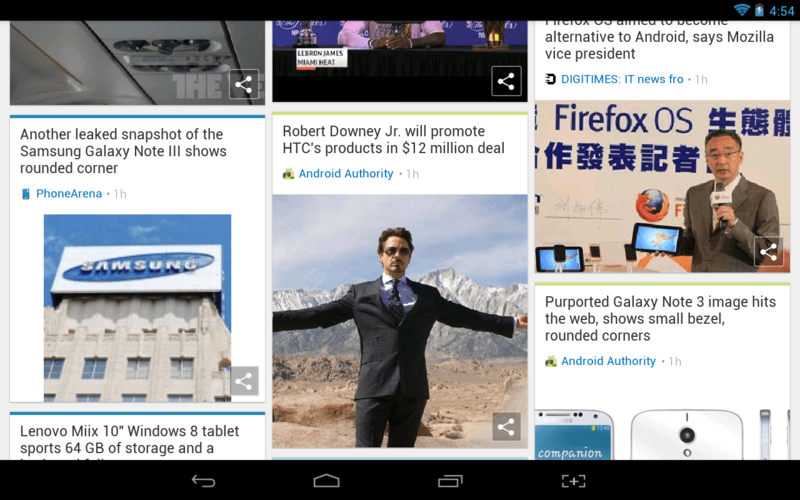 This works just like Pocket and allows you to save content for reading later if you’re in a rush. 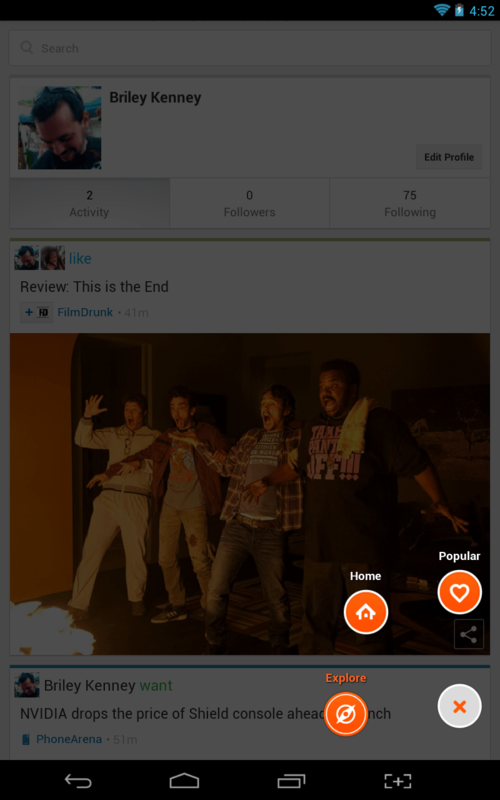 Finally, you can’t have a social app of this caliber without an option to search for your friends. It also makes sense that you can search using connected Facebook, Twitter and even Google Plus accounts. You can also search for Rockmelt user profiles, or browse suggested users. If you don’t want to participate in the social aspects of Rockmelt you don’t have to. Once it’s all setup, and you’re logged in you can use it just like any other mobile reader really. The UI is certainly appealing and the text content is minimal yet attractive while you’re reading. Rockmelt offers pretty much what you’d expect from a mobile reader, including a responsive setup. Rockmelt is a reader for Android that starts out being a little different, but really ends up being just more of the same. That’s not a bad thing, however. Just like any other reader, you can subscribe to content, and you can even subscribe to feeds directly through the app. What makes Rockmelt stand out is the social aspect. If you have no interest in being social, you can use the app as a news reader, but honestly you’ll be missing out on most of the fun and there is no significant reason to use Rockmelt if you don’t want to be social. To sum up, if you want just a basic reader, you’d be better suited looking elsewhere . If you want to interact with others and experience a little social action while you browse the feeds, then Rockmelt is great for that.